After breakfast, drive to Haridwar- known as Gateway to heaven, world famous for temples and Ghat. On arrival visit Har-Ki-Pauri- the footstep of God, later drive to Rishikesh- also known as the "Place of Sagers" and most famed for its yoga sessions & one of the most important pilgrimage cities too. On arrival transfer to the Yoga and Meditation Ashram. After relaxation visit Lakshman Jhula (bridge)- it is an iron suspension bridge and this bridge was built in 1939, upon the sacred river of Ganges. Later get the information about Yoga meditation by Yoga instructor. Overnight at Ashram. During these days you got the Yoga meditation training. 1500-1600: Antar Mauna (practice of inner silence). After breakfast drive to Haridwar, on arrival visit Mansa Devi Temple- dedicated to Goddess Mansa and Chandi Devi Temple- located on the Neel Parvat and dedicated to Goddess Chandi Devi. Later drive to Delhi, on arrival transfer to the hotel for overnight stay. 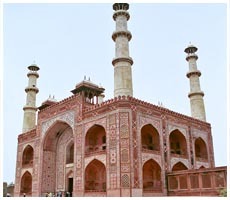 After breakfast, visit historic monument Red Fort- built between 1638 - 1648 with marvellous red stone, Jama Masjid- the principal mosque in India was built in 1650 both are constructed by Mughal emperor Shah Jahan, Chandani Chowk- a shopping hub you can enjoy Rickshaw ride in Chandani Chowk. Rajghat- interment site of Mahatma Gandhi (Father of the Nation). President House- earlier recognize as Viceroy’s House was built in 1921, now the authorized residence of President of India. India Gate- war memorial built in 1931 and designed by Sir Edwin lutyens. Humayun’s Tomb- Humayun specially made this tomb for his wife Hamida Banu Begum in 1562 (UNESCO World Heritage), Lotus Temple- also known as Baha'i house of worship, Qutub Minar– UNESCO World Heritage site was built in 1192 by Qutub-ud-din Aibak. Overnight at hotel. 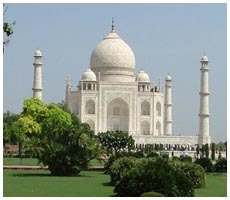 Early in the morning, you will be the witness of most memorable view of Taj Mahal at the time of sunrise. Return to hotel for breakfast, later drive to Jaipur and enroute visit Fatehpur Sikri- this place is incredibly famous for its monuments built in Mughal Era. After lunch continue drive to Jaipur, on arrival transfer to the hotel. In the evening enjoy rickshaw ride to explore the colorful market of Jaipur. Overnight at hotel. 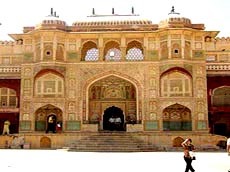 After breakfast explore Jaipur- the Pink city of India, visit Amber Fort- it was built in 16th century, enjoy the experience of elephant ride, Hawa Mahal (Palace of Winds)- built by Maharaja Sawai Pratap Singh in 1799, Jantar Mantar- an astronomical observatory site built in 18th century by Maharajah Jai Singh II, later drive back to visit imperial City Palace- a miraculous palace to witness the real Rajasthani and Mughal architecture of Jaipur built in 1729 by Sawai Jai Singh II and visit City Palace Museum. In the evening drive to Delhi, On arrival transfer to International airport to board the schedule flight to hometown and tour concludes with happy memories.